Greenlands Farm will host their fourth annual Winter Farm Fest on Saturday, December 5th 2015, from 5 PM to 8 PM. Rain date is scheduled for December 6th, 5 PM – 8 PM. Join Greenlands Farm while they bring in good tidings...gather around a warm fire with homemade graham crackers and marshmallows! Bring your whole family and capture a glimpse of the true meaning of Christmas with our live and interactive nativity scene. 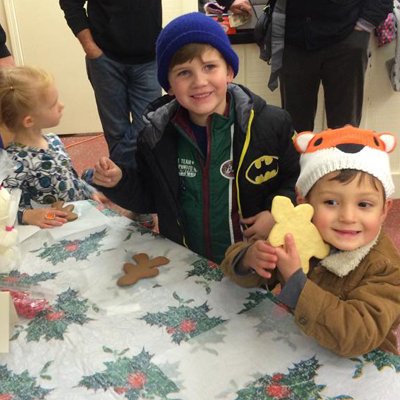 Let the kids enjoy hot cocoa, book readings, and fun winter crafts. We hear Santa may be stopping by to visit as well! Experience the magic of the season with live carolers and music in our piney forest Winter Wonderland, take a llama “sleigh” ride through winter lights, and cozy up by the yule fire. Come join Greenlands farm in celebrating the most wonderful time of the year! Don’t forget to dress warm! You can purchase tickets at the event but we encourage you to pre-purchase to avoid long lines. A majority of all event proceeds go to support our rescued farm animals including hay for the winter, feed, animal care, and vet care. This event is a fundraiser for your local educational farm and farm animal sanctuary. Herb Harton has become a staple performer here at many farm events. He is a retired motion picture camera operator who now spends his time performing and teaching guitar. He grew up in western NC during the birth of rock & roll, the rebirth of the blues, and was always saturated with folk, country, and rythm, and blues songs. His repertoire is a vast, eclectic mix of thousands of song and he performs them all with gusto.He sings with a powerful voice that has extensive range and years of training. He is a walking history book of facts about the songs and the artists who wrote them. Come Join us and listen to seasonal music under the lights and stars. He's a one man band that you don't want to miss. Lights, lights, lights!!! We light the farm's woods up with thousands of lights and light your sleigh ride with luminaries...it's stunning! We have delicious holiday treats for you in our store! Cookies, caramel popcorn, s'mores (you can roast by our yule fire! ), hot cocoa, and other wonderful holiday specialties. This is a very special and wonderful event for all ages. The farm is quiet and so peaceful at night in the winter and the lights create an ambiance that can't be repeated elsewhere. Come do something special this holiday season! "This is one of the most special evenings I've spent at any holiday event." - guest of last year's. Brunswick Electric Membership Corporation for providing light! They graciously donated the use of their light towers for our parking area, we greatly appreciate their continued support of Greenlands Farm. 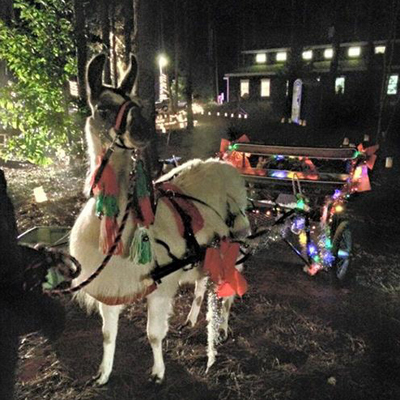 Hoffman Septic Service of Bolivia, NC for providing the sand for our luminaries that light the sleigh ride trail! Steve Hoffman is a great neighbor and supporter of Greenlands Farm. A majority of paid activity/ticket sale proceeds go to our rescue petting farm and farm animal sanctuary. You must purchase a ticket or show proof of purchase for all paid activities. Each ride ticket purchased is for one ride and one person. Please read ride rules at ride station. Each petting farm ticket (live nativity scene) is for entry all day, you must show your stamped hand to re-enter. Children under 1 are free. Please read petting farm rules before entering, posted outside petting farm gate. We suggest you bring a chair or blanket for hanging out, eating, listening to live music. No outside cooler, food, drink, or alcohol. All bags subject to search. No pop-up tents or umbrellas. No contraband or illegal substances allowed. No dogs or pets of any kind. No posting of upcoming events. No passing out flyers or pamphlets. Parking for all access is next to the farm store, handi-capable parking is available in front of the farm store along Midway Road. Please display your parking permit for handi-capable parking. • Alcohol will not be sold or served to persons less than 21 years old, you must be born on or before the festival date in the year of 1994. • Alcohol cannot be possessed or consumed by persons less than 21 years old. If a parent provides a minor alcohol, it is illegal and not allowed. • Alcohol will not be sold or served to any person who is intoxicated. • Intoxicated persons will not be allowed to consume alcoholic beverages. 1. Current driver’s license from North Carolina or other states. Currently, when drivers renew their driver’s license in our state, the NC Division of Motor Vehicles provides a paper 20 day driving certificate and then mails the permanent photo ID/driver’s license to the driver. Drivers are allowed to keep their old license until the renewed license is mailed to them. The temporary, 20 day paper license is considered a valid driver’s license, but the customer should also show their expired license along with the paper certificate when asked for identification. 2. U.S. Military Identification. These identifications are green and white with a photograph of the individual and physical description. 3. North Carolina Identification Card. An official State of North Carolina Special Identification (ID) card that has a photograph issued to a person who does not drive. Identification cards from other states are not accepted. 4. Official passport issued by any nation. Passports may be in the booklet or card form. Official forms of identification include a photograph, date of birth and written or electronic signature. Powered by Squarespace. Content copyright 2014. Greenlands Farm. All rights reserved.